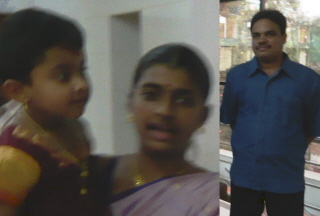 The elder daughter of my uncle N.K.Venkateswaran - Poornima, wife of L. Suryanarayanan has, after 3 years of residence in the UAE, relocated to India on 5 January 2013 with family. Suryanarayanan, also known as Suresh, became a resident of the UAE 3 years ago upon being sent on deputation by Dhanalakshmi Bank where he has been working for quite some time now. Poornima was working as a Teacher in a SChool in Sharjah and daughter Haritha was studying in the same school. Following the 3 year deputation period, his services were relocated to India where he has been posted at Ponnani in Kerala. Consequently, the family comprising Poornima and daughter Haritha left UAE cherishing their pleasant memories. We miss them, but wish them all the best wherever they are.